In the prefab, select the ‘Rig’ tab. Ensure the ‘Animation Type’ is set to ‘Humanoid’. Ensure ‘Optimize Game Objects’ is deselected. InstantVR requires a number of bones to be mapped correctly. You can check this by clicking the ‘Configure…’ button. The following bones need to be mapped correctly. Note that the ‘Hips’ bone should be mapped to a bone at hip-height. Sometimes this is the root at the ground level, which does not lead to the right pose. You can insert your own avatar by removing the default_simple game object with you own. When you have done this, InstanVR will use the new avatar in the scene. The easiest way to do this by temporarily dragging the target to a child position of the applicable bone in the hierarchy and setting the local position to zero. After this you can drag the target back to its original position as a child of the Targets game object. 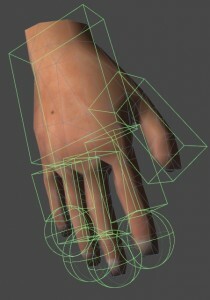 If you want to have fully interactive custom avatar you will need to add a number of colliders to the hands. I found out that the best experience is achieved by sizing the colliders 1 cm bigger than the mesh and setting the Minimum Penetration for Penalty to 0.01. In this way you fingers will accurately collide with any non-kinematic rigidbody. 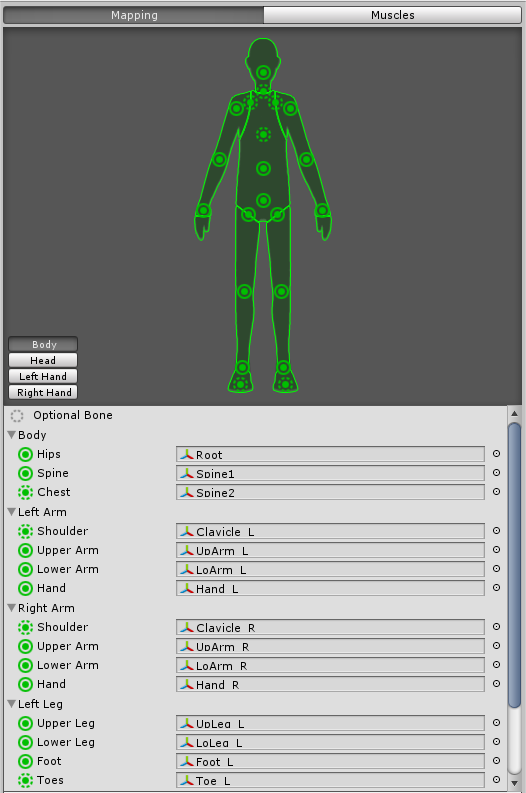 To get the correct positions from your avatar you should align the head, hip and foot targets with the corresponding bones in the body as every avatar will has a slightly different bone structure. Now we have an avatar that can move, but you will notice that you are not able to pick up objects. This is because the hands do not have colliders. 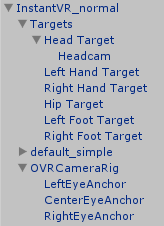 InstantVR is not able to add colliders automatically, so we have to add them manually. For my avatars I only use Box and Sphere colliders. Capsule colliders seem to be unreliable, especially between the two end spheres, so I try to avoid them where I can. Mesh colliders are not an option either, because of their limited collision support. In the image on the right you can see the collider setup I use for most of my avatars with box colliders for the overall hand structure and sphere colliders at the end of the fingers. This setup ensures that the colliders will also work well when the fingers are curled as you can see in the other figure. 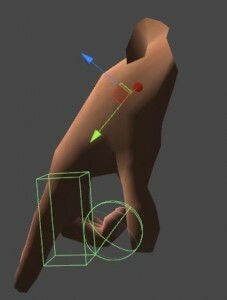 For the fingers, the box colliders need to be attached to the first (proximal) bone. The sphere colliders are attached to the last (distal) bone. Also note that the colliders are larger than the mesh itself. This is to compensate for the Minimal Penetration for Penalty, which I usually set to 0.01. Making the colliders 0.01 larger than the mesh ensures that you can touch objects exactly at the mesh boundaries. Especially with the finger tips, this is very important for immersion. That is basically all there is to use your own avatar. I have tried to make it as easy as possible, but it may still be tricky in some cases. So do not hesitate to reply if you are using InstantVR Advanced and still have issues with you avatar!